You and your companions are highly skilled members of a disease-fighting team waging a battle against four deadly diseases. Your team will travel across the globe, stemming the tide of infection and developing the resources you'll need to discover the cures. You must work together, using your individual strengths to destroy the diseases before they overtake the world. The clock is ticking as outbreaks and epidemics accelerate the spread of the plague. Will you find the cures in time? The fate of humanity is in your hands! 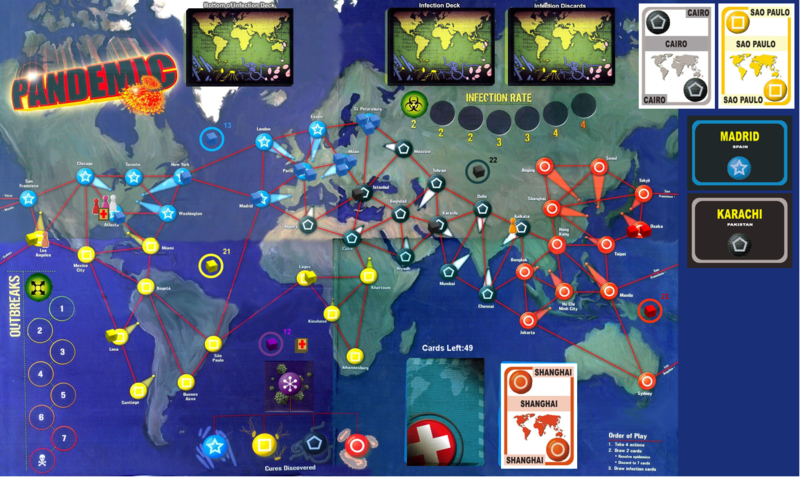 This will be a Play-By-Post Virulent Strain Variant Game of Pandemic for 5 players, participants from sign-ups. 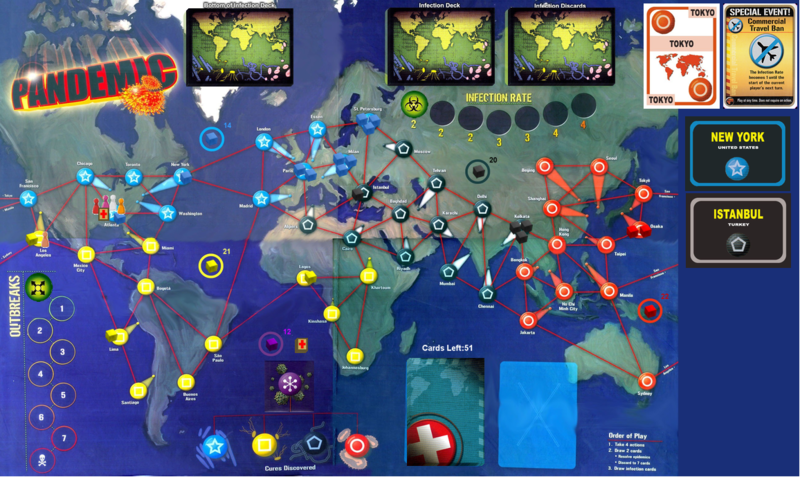 Pandemic is a cooperative game. You and your fellow players are members of a disease control team, working together to research cures and prevent additional outbreaks. Each of you will assume a unique role within the team, with special abilities that will improve your team’s chances if applied wisely. The object is to save humanity by discovering cures to four deadly diseases (Blue, Yellow, Black, and Red) that threaten to overtake the planet. If you and your team aren’t able to keep the diseases contained before finding the necessary cures, the planet will be overrun and the game will end in defeat for everyone. The game plays as normal until the first (Virulent Strain) Epidemic card is drawn. When a player draws the first Epidemic card, and after performing the Infect step of this first Epidemic card, count the cubes on the board for each disease; the disease with the most cubes on the board is the Virulent Strain. (If there is a tie, randomly determine the Virulent Strain from among these tied diseases.) Place the Epidemic card next to that disease’s cube pile as a reminder. 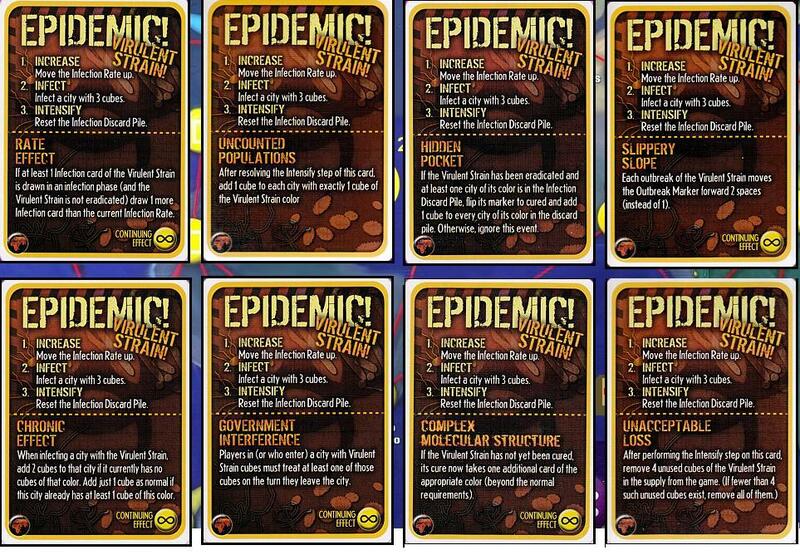 In addition to the normal Epidemic effects, each Virulent Strain Epidemic card has its own unique effect which applies to that disease only. Some cards are marked with an icon indicating that they trigger a Continuing Effect; keep these cards faceup as reminders for the rest of the game. A player would need to turn in 6 city cards of the Virulent Strain color to cure this disease, except for the Scientist, who could turn in 5 cards, or the Field Operative, who could turn in 4 cards and 3 samples. The effects of the event Mobile Hospital (when applied against Virulent Strain cubes in cities that a player is in or has entered) will negate the effects of Government Interference. The Containment Specialist’s power does not negate the effects of this card, nor do the events Remote Treatment or Rapid Vaccine Deployment, (unless all Virulent Strain cubes in the city in question are removed). 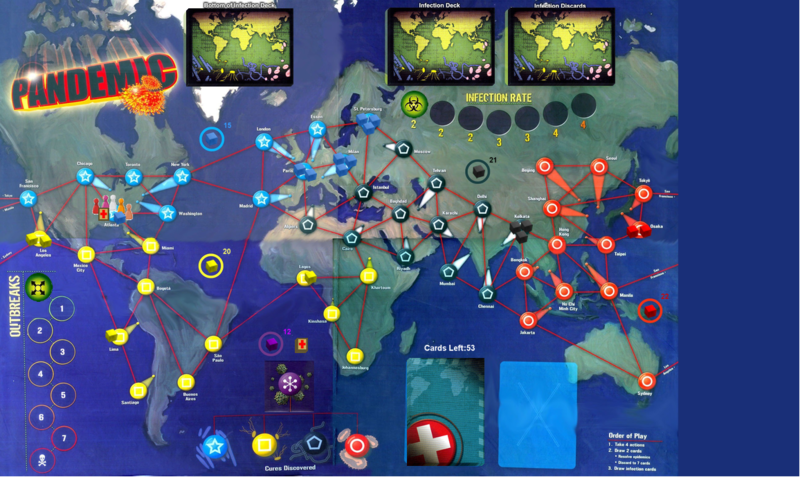 Players collectively win the game immediately when the cures for all four diseases (Blue, Yellow, Black, and Red) have been discovered. Players do not need to administer cures to every infected city in order to win the game—victory is instant when any player discovers the fourth and final cure. Looking for 2 more players. Please check out -Virulent Strain Variant & EPIDEMIC! Cards- in the 2nd post for the replacement cards. We will let the group decide on how many Epidemic cards will be in this game. Please indicate choice in bold limegreen! I need me some free healthcare. I got Azure's Balls after the last one. GG, you're already in the game, you silly goose, (not Goose!, but goose). and really, who's that hottie on your av? Charlize Theron from A Million Ways to Die in the West. The quote was the only one I felt I could use without spoiling some of the better parts of that fantastic movie. I'll play if you need another. Yeah, we barely got to play before the diseases ate us alive last game. For five players, plus virulent strain, I'd vote for five epidemics at most. Those virulent strain epidemics can be awfully harsh. I have never played, but am interested in learning. Reserve up. As pointed out in Game 15, "random" is a valid role choice. - 1 facilitator (dispatcher, archivist, operation expert) ideally in position 4. That said let's be epidemiologist. Well, I'm in position 2 so I guess I should be Medic again unless Troubleshooter would be better in this spot. I have never played pandemic before so what do I do? Scientist I guess? Those are good right? Please ignore the purple cubes, as we are not playing with them this game. Preda has 4 actions to play. The only bit of Preda's plan I don't understand is how he's treating both Osaka and LA. Unless LA is his plan for his second turn? One more thing: the virulent strain epidemics will all target whichever disease has the most cubes on the board when the first epidemic card is drawn. Given the current distribution, there's an excellent chance that blue will be our virulent disease. Just something to keep in mind. Ah, got it. I thought he was taking the Osaka card and using it to treat Osaka. My mistake. Yes, I go to cure red, while Goose will go for blue. Better to have it cured if it's the virulent one. I wouldn't use Atlanta for a charter flight unless an epidemic pop out before goose turn. I could go to Shanghai and work over to Kalkala or whatever that black 3 is to hopefully stopping black from exploding. My options are limited, atm. My suggestion: Drive/Ferry to London, treating either Atlanta or New York along the way. This will let Phyphor move to you and give you the London card on his turn. If you draw a blue card, you'll be able to cure blue on your next turn, which should be our first priority. If you don't draw blue, we'll still be 3/4ths of the way to curing blue, and perhaps Phyphor can move you to Madrid so that I can give you that card on my turn. That sounds good. Sorry I've never played Pandemic before and I have been doing so many other games that I didn't really get the chance to look into it yet. I saw the Sao Paulo card and for some reason thought it said "Sad Panda". If I was you, Goose!, I'd heal NYC since it's connected to another blue cubed city. Oh wait nvm I'll let someone else cure ATlanta, I'll walk to NY, cure there, then go to Madrid? You only have four actions per turn. If you treat atlanta, move to dc, move to new york, and treat new york, that will be your four actions. Alright so I'm going to leave Atlanta for someone else, move the 2 spots to NY, treat the cube, then move to London, not Madrid? Yeah, that way Phyphor can give you London on his turn.